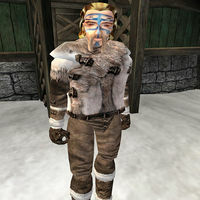 Graring is a Nord barbarian located outside his house at a river fork far north of Fort Frostmoth. He and his two friends have discovered Raw Stalhrim and Carnius is not too happy about it. If you have sided with Falco, you can gain the Nords' trust by helping them dispatch an attacker, Coventina Celata. Graring has the Ancient Nordic Pick Axe necessary to harvest the mineral, as well as a Stalhrim Mace. Discovery in the Mine: Investigate a strange burial chamber just discovered deep within the ebony mine. "You... you are not here to hurt us? Then perhaps you are different from the rest. You seek knowledge of the Stalhrim, yes?" sacred: "The Skaal consider the Stalhrim to be holt. During the great war with the Dark Elves, many heroes fell in battle. Some could not be returned to Skyrim, and were buried here. Great magicks were worked on their tombs to protect their belongings from grave robbers, and their corpses from worse things. Energy was drawn from the land itself, and our heroes were encased in tombs of ice. That ice is Stalhrim." Stalhrim: "You are not the first to seek it. Outsiders like this woman have been here before: always demanding, always offering payment that is useless to us. But they get nothing. The Skaal give them nothing because they call it sacred: we give them nothing because we know they would misuse it." This page was last modified on 19 February 2018, at 02:59.